the translation of this Italian world is "little net". 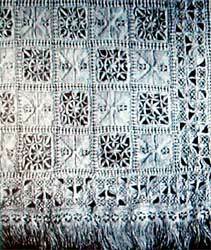 This is a kind of cutwork where square of woven linen are cut and removed. The remaining part froms a net upon which the stitches are placed. The name " Reticello" apperas for the first time in Vecellio's book Corona in 1591. Most of the time Reticella was used associated with other forms of lace and embroidery. The " Old Italian Lace" book by Elisa Ricci, shows many example of such compositions.